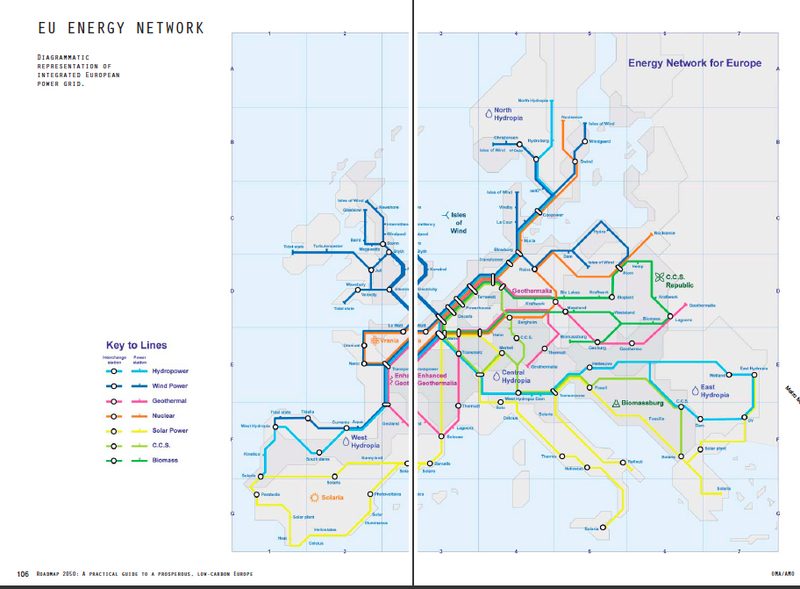 Brussels, 13 April, 2010 – AMO, the think tank within the Office for Metropolitan Architecture (OMA), has extended its expertise in planning into the design of the future energy infrastructure of the EU as part of Roadmap 2050: A Practical Guide to a Prosperous, Low-Carbon Europe. The project, proposing an EU-wide decarbonized power grid by 2050, launches in Brussels today to an audience of European leaders. Roadmap 2050 is commissioned by the European Climate Foundation and is based on extensive technical, economic and policy analyses conducted by five leading consultancies: Imperial College London, KEMA, McKinsey & Company, Oxford Economics and AMO. The project is based on European leaders’ commitment to an 80-95 percent reduction in CO2 emissions by 2050. The report outlines why a zero-carbon power sector is required to meet this commitment and illustrates its feasibility by 2050, given existing technology. The project then aims to chart a policy roadmap for the next 5-10 years based on the near-term implications of this commitment. Through the complete integration and synchronization of the EU’s energy infrastructure, Europe can take maximum advantage of its geographic diversity: by 2050, the simultaneous presence of various renewable energy sources within the EU can create a complementary system of energy provision ensuring energy security for future generations. 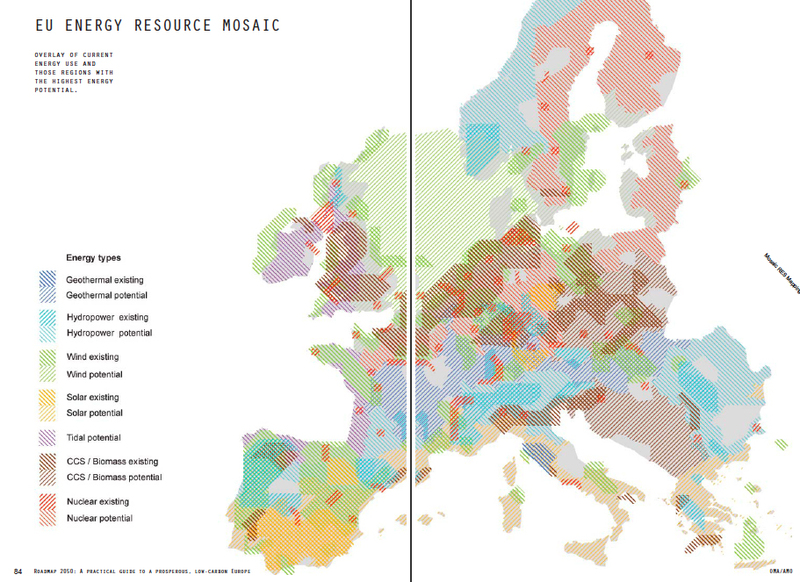 AMO contributed to the content development through the production of a graphic narrative which conceptualizes and visualizes the geographic, political, and cultural implications of the integrated, decarbonized European power sector. The project builds on two foundational AMO projects: the Image of Europe exhibitions, commissioned by the Dutch EU Presidency in 2004 (which included the proposal for a composite ‘barcode’ EU flag), and Zeekracht, a plan made in 2008 for a ring of offshore wind farms in the North Sea. 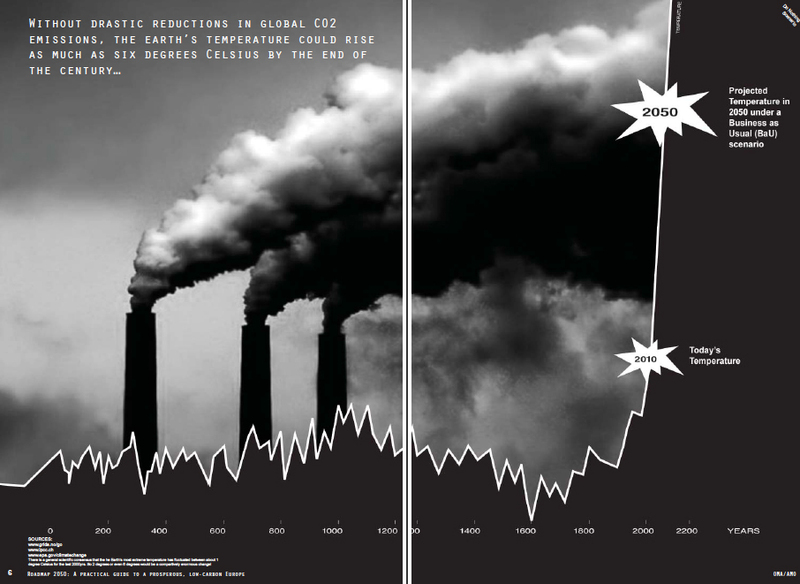 In the last 200 years, the technological breakthroughs of steam power (1780-1860), railroads (1839-1970), electricity (1899-1929) and IT (1991-2000) were all initially met with skepticism and even obstructionism from vested interests. 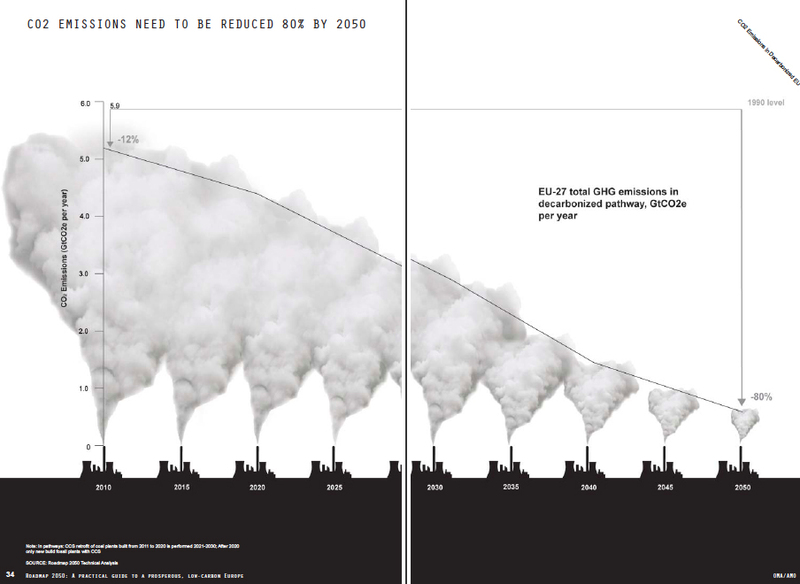 But, as the technical analysis in Roadmap 2050 shows (see pages 86-87), after coordination and planning, each new technology significantly increased GDP and ultimately succeeded in changing the way we live. 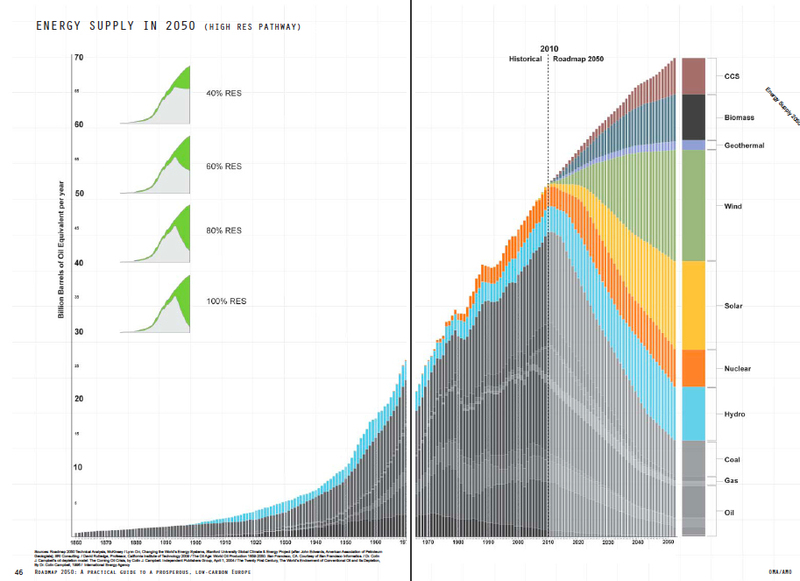 AMO illustrates here the striking similarities between technological progress in the past and the potential of renewable energy today.